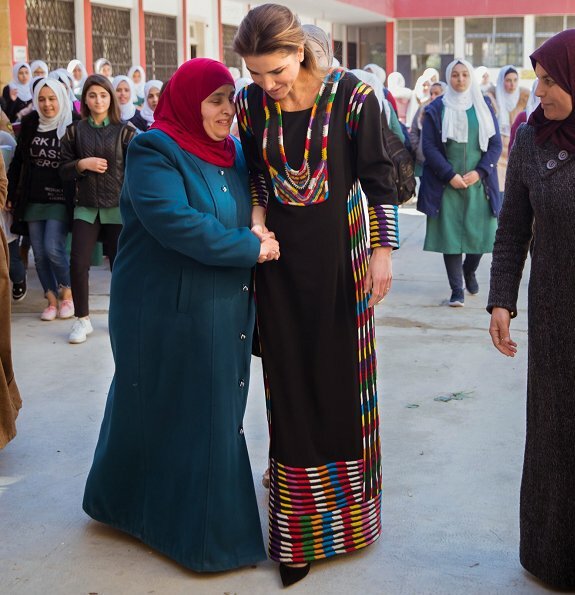 On February 13, 2019, Queen Rania of Jordan visited the Jerash Women Charitable Society and Lubaba Bint Al Hareth Secondary School in Jerash. Established in 1971, the Jerash Women Charitable Society is one of the oldest community-based organizations in Jordan, and the oldest in Jerash. Its chief objectives include supporting community members in need through direct aid, and providing training opportunities for women to empower them with vocational skills. While in Jerash, The Queen also visited the Lubaba Bint Al Hareth Secondary School for Girls. Yes! I have also always admired Rania for living by her own principles. That is one stunning outfit, for sure! I love the playing with the color in so many patterns. It is an inspiration, so much like the idea behind Amish quilts, don't you think? Or some of the work by the Seminole people? The interaction with the women seems tender and respectful from all sides. This is a lovely set of photos. Just gorgeous and very appropriate. Nice dress.Rania looks lovely wearing it. Stunning look - she is a beautiful woman and although I am not aware of the specifics, I am inclined to believe there is a strong traditional element to the design.